Now that the weather is getting warmer and activities move outdoors for pool parties and BBQs, it’s the perfect time to explore making unique iced coffee drinks to keep you caffeinated and cool all summer long. One ingredient we found to make unique iced coffee is Maple Water. Maple Water is a refreshing drink made from the sap of maple trees. Not only is it tasty but it’s also packed with nutrients like antioxidants and electrolytes. We tried brewing both hot and iced coffee with Maple Water instead of regular H2O and the results were delicious! Maple Water adds a slightly sweet, natural hint of maple syrup that allows you to forgo the extra sugar packets. Here’s how we recommend brewing your next iced New England Coffee with Maple Water. 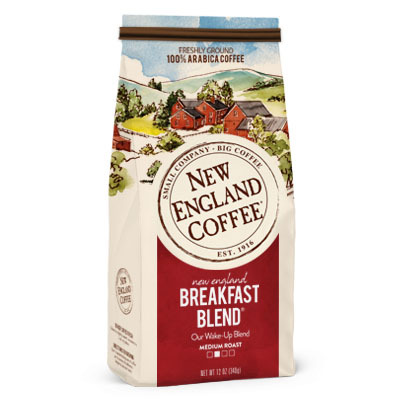 You will need your favorite New England Coffee (we used Breakfast Blend) and a container of Maple Water. That’s it! For iced coffee, we recommend using 2 rounded tablespoons of New England Coffee for every 6 ounces of Maple Water, but you can adjust the amount of coffee to suit your personal taste. Brew the coffee and Maple Water using your preferred method and allow to cool in the refrigerator. Pour over ice and enjoy! Helpful Hint: Make Maple Water Coffee ice cubes ahead of time for a perfect chill that won’t water down your drink. Simply brew New England Coffee and Maple Water then freeze in ice cube trays. More of a frozen beverage fan? We’ve got you covered. Food Network has instructions for making a simple coffee frappe in minutes. We recommend using your favorite New England Coffee and swapping out regular ice cubes with Maple Water Coffee ice cubes. Have any extraordinary coffee recipes you want to share? Send us a note and you might be featured in the next New England Coffee blog post!